Today, a new student or researcher must assemble a collection of scattered conference publications, which are typically terse and commonly use different notations and terminologies. This book provides a self-contained explanation of the mathematics to readers with computer science backgrounds, as well as explaining computer science concepts to readers with backgrounds in applied mathematics. The first section presents mathematical notions and models, including message passing and shared-memory systems, failures, and timing models. The next section presents core concepts in two chapters each: first, proving a simple result that lends itself to examples and pictures that will build up readers' intuition; then generalizing the concept to prove a more sophisticated result. The overall result weaves together and develops the basic concepts of the field, presenting them in a gradual and intuitively appealing way. The book's final section discusses advanced topics typically found in a graduate-level course for those who wish to explore further. Grad / undergrad students in CS or Math; as well as working researchers or computer engineers. Maurice Herlihy received an A.B. in Mathematics from Harvard University, and a Ph.D. in Computer Science from M.I.T. He has served on the faculty of Carnegie Mellon University, on the staff of DEC Cambridge Research Lab, and is currently a Professor in the Computer Science Department at Brown University. Maurice Herlihy is an ACM Fellow, and is the recipient of the 2003 Dijkstra Prize in Distributed Computing. He shared the 2004 Gödel Prize with Nir Shavit, the highest award in theoretical computer science. In 2012 he shared the Edsger W. Dijkstra Prize In Distributed Computing with Nir Shavit. Prof. Dmitry Kozlov is recipient of the Wallenberg Prize of the Swedish Mathematics Society (2003), the Gustafsson Prize of the Goran Gustafsson Foundation (2004), and the European Prize in Combinatorics (2005). He has been a Senior Lecturer at the Royal Institute of Technology, Stockholm, and an Assistant Professor at ETH Zurich. Currently he holds the Chair of Algebra and Geometry at the University of Bremen, Germany. 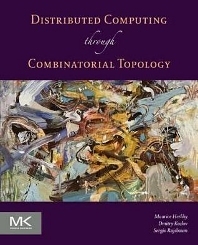 He is the author of the book Combinatorial Algebraic Topology published by Springer Verlag in 2008. Prof. Sergio Rajsbaum is a member of the Institute of Mathematics at UNAM, where he is now a Full Professor. He has spent postdoctoral and sabbatical stays at the Massachusetts Institute of Technology and HP Research Labs. His main research interests are in the theory of distributed computing, and has about 100 publications in prestigious conferences and journals, and has been Program Committee member, and Program Chair of main forums in the area, such as the ACM Principles of Distributed Computing. covering the exciting topic of understanding distributed computing through topology.